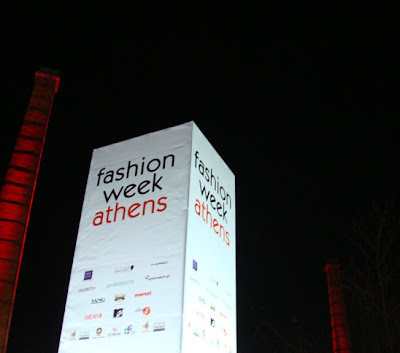 Fashion Architect: Fashion Week Athens, a bad start? Three days instead of seven. One catwalk instead of three. 12 shows by greek designers instead of 21. Zero shows by foreign designers instead of 8. No interesting fashion crowd hanging around. I could go on and on, but it's only day one, so I'll give it all a chance to improve. And I should mention - in the organizers' defence - that there actually is a photography exhibition by former-male-model-turned-fashion-photographer Spyros Poros and there is also an exhibition of the creations of last fashion week's workshops. Both exhibitions are open to the public. Those of you who can read greek, do pay a visit to Stella of Shopping Therapy (who I happend to bump into at the Workshop's Exhibition). 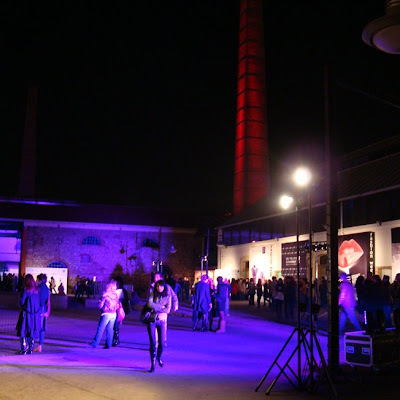 She has written a hillarious post about exactly what happened outside the Makis Tselios show, and other fun trivia. Those of you who can't read greek, here's the short version: Old ladies screaming at the bouncer, because they weren't allowed into the Makis Tselios show, even with invitations. The show was supposedly already full. I think I would scream too. Lopi thanx a looooott!!!!!!!!!!!!!!!!!!!!!!!!!!!!!!!!!!!!!!!!!!!!!!!!!!!!!!!!!!!!!!!!!!!!!!!!!!!!!!!!!!!!!!!!!!!!!!!!!!!!!!!!!!!!!!!!!!!!!!!!!!!!!!!!!!!! Because of your post I won me a invitation to the fashion week...Just saw it! I' ll be posting photos..So excited...Oh, my god, what am I going to wear???? See you there!!! Oh dear, I hope it gets better! you are right, this fashion week is indeed fashion "weak". however, it was so close to not happening at all. due to lots of stuff going on behind the scenes, I think the safest thing to do this time around is to speak about the designers work which is of high standards so far (whether what the do is of my taste or not). don't get me wrong, I am so on your side on this one and I am not defending ANYONE for the state of FWA#9. Hope you enjoyed yesterday's shows,x. but then again, we are reading the plays in standardized - english edition, not exactly from the original.